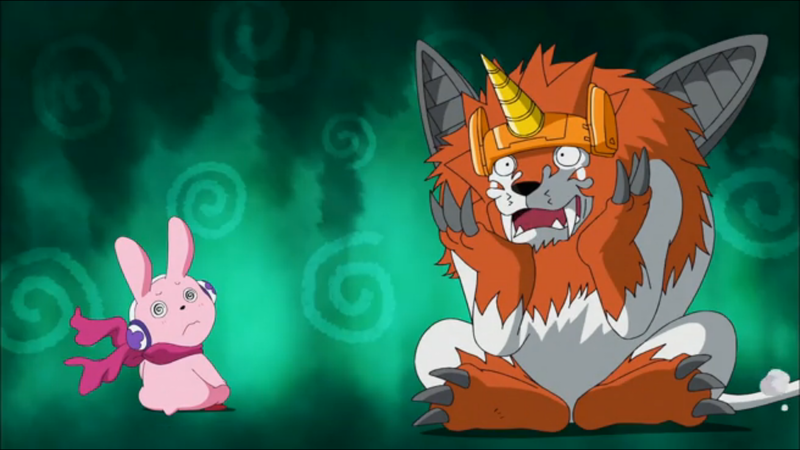 Digimon: System Restore: Fusion Episode 40: Gold Land And The Irate Pirate! Fusion Episode 40: Gold Land And The Irate Pirate! In this episode, the team learns valuable lessons about friendship, loyalty, and abandoning both at the first opportunity to become a for real pirate. Another cut scene to talk about Dr. Wily's castle and we're on to Robot Master #5 (seriously, there's a Pirate Man in the Mega Man canon; I did not know this until just now). A few things get switched up this time around. Rather than hiding behind an army of minions, the Dark General is literally the first local we see in Gold Land. You can tell right away that Olegmon is something different, showing great admiration for the Fusion Fighters and spouting the virtues of camaraderie and friendship so much you'd think he had a cutie mark. It throws our expectations out of whack and opens us up to some real surprises. That's really important, because while the actual events of Gold Land are trite and conventional, the execution is anything but. There's no other way to explain why this episode is so enjoyable. It's nothing original for Olegmon to have an ability that draws his foes over to his side. We just finished a storyline where one of the key Fusion Fighters appears to join the bad guys. The cliffhanger of Ballistamon's reprogramming is presented in horribly cliched fashion. Dub edits and changes are rampant and sure to be reviled among anyone who's watched Xros Wars. This episode should not be this damn fun!! It's similar to the World Tour episodes, which were pointless, filled with plotholes, kept the main plot stalled right before the home stretch... and stand among of the fondest things we remember about Zero Two. This episode is more guilty of being trite than any of that, but Olegmon's pure enthusiasm is infectious, making it impossible not to have a good time. And to top it off, we're dealing with pirates! 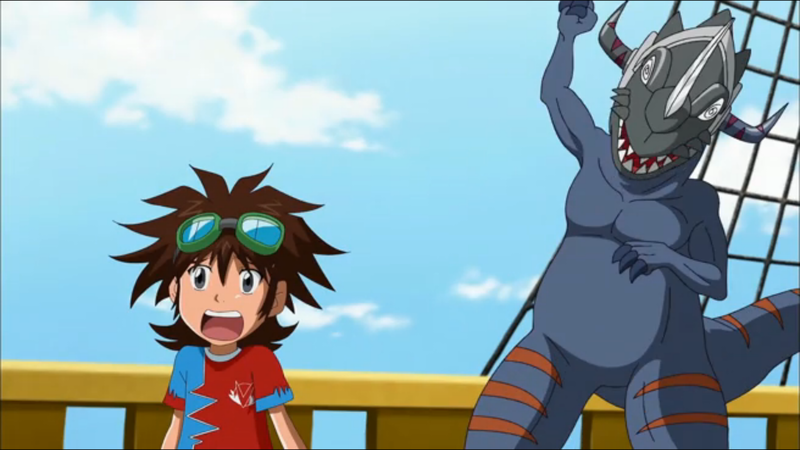 It's hard not to love the chanting, pirate forms of Cutemon, Greymon and Sparrowmon. It's almost tempting to cheer for these guys rather than worry about the devastating position it puts the Fusion Fighters in. Mikey is too busy trying to get them out of this position to really freak out, and it's one place where Christopher's lack of emotional attachment to his team is an asset. Sparrowmon's turn really hits Nene hard, however, to the point where she struggles to get back into the action. For all of the spotlight Mervamon's had lately, Nene has always relied on Sparrowmon as a true partner. When that loyalty seems to vanish, Nene is so thrown that all she can do is sit idle and play with her hair. Incidentally, has anyone noticed she has weird hair? You'd think someone would call her out on that. Ballistamon seems affected the most by all this. This sudden focus on him could be seen as surprising, but given how he and Shoutmon have known each other the longest (save maybe Shoutmon and Lillymon, who seems to have joined the team just to be in this episode), it's natural that he be bothered the most. A flashback shows us Ballistamon's origins, and while it's a question we may not have asked before, the incredible resolve Shoutmon shows to get him operational and friendly leads Ballistamon to insist on returning the favor. It works, better and more capably than anyone else who would try. In the end, Ballistamon is rewarded by being re-reprogrammed back into his original form DarkVolumon. 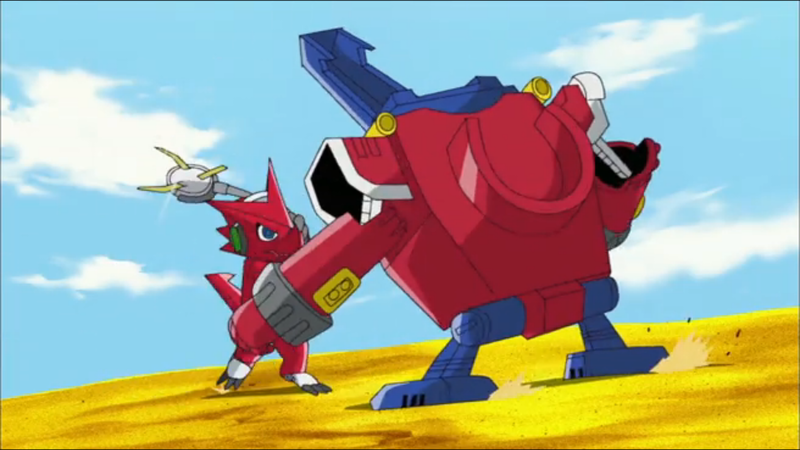 We do have to wonder about the sudden mechanical knowhow Shoutmon exhibited to change DarkVolumon into Ballistamon, and especially the expertise of Olegmon's minions to change him back. There's some real Kimeramon-style implications in all that, even if Shoutmon's intentions were to create something as awesome as Ballistamon. Ultimately, his malicious former self is ominous enough, and despite Shoutmon's Shatner-esque scream to close things out, it represents a more potent transformation than all the silly side-switching earlier. Boy, does this series really love its foreshadowing. All that brother/sister stuff in the Zamielmon episodes, and now Christopher openly criticizing Deckerdramon's constant backtalk. In a moment that appears to be a dub addition, Olegmon says the name of his ship is the Misery, which we should all hope is a nod to the Going Merry. That's right, the dub may have added a One Piece reference. Actually, the Japanese version is surprisingly hesitant about calling Olegmon and his men pirates. The dub does so unabashedly and it's probably for the better. Another milestone for the dub is that I believe it's the first time Christopher and Nene's last names are spoken (without going back, I have to assume Jeremy's dropped a “Mikey Kudo” or two... it's practically Zenjirou's catch phrase). It's a big deal only in the sense that we're always paranoid about the show not acknowledging that the characters are Japanese, even if their full names are displayed every episode. Maybe it harkens back to how everyone's full names appeared in the first episode of Adventure, but their last names were rarely, if ever, spoken until Zero Two. Olegmon has an attack called Broadsword Boomerang. He throws two axes. And Falcomon's an owl. So yeah... Sparrowmon (told you the dub changed a lot)... for all the times we accuse the dub of changing things to be more silly, it's really hard to give it flak for making something more serious, especially since everything else pretty well handles the silly quota. As a big fan of the Nene/Sparrowmon dynamic, it's a really potent addition at the expense of a moment where Nene seems superficial and self-conscious.